Renowned for magnificent “glasswork and interior design” is a Protestant catholic shrine located in Himachal Pradesh called the St Andrew’s Church. 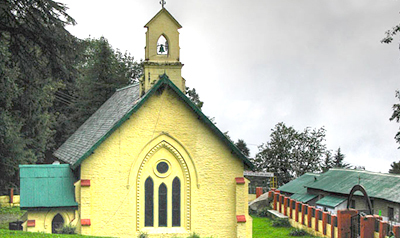 This exquisitely designed church is situated in Dalhousie in the middle of the cantonment area, and hence special permission is required to visit it. In addition, even though this church is over hundred years old it still appears to be in good condition as a result of the efforts put in by the management. Furthermore, this church is also commonly referred to as “Church of Scotland”, and attracts a large number of tourists annually. The climate is pleasant in Dalhousie especially during the summer with the temperature ranging from maximum of 35 degree Celsius to a minimum of 16 degree Celsius. So the ideal time to visit this church would be from March to May. The nearest railway station to this church is located in Pathankot at a distance of 80 km. The Pathankot Railway Station is well connected to major cities such as New Delhi, Jaipur, Bhatinda, Ahmedabad, Jodhpur etc. There are two routes from New Delhi to this church, and they are via NH44 and via NH9 and NH44. There are two routes from Chandigarh to this church, and they are via Bela-Behrampur, via NH44, and via NH44 and Chamba-Pathankhot Road. There are two routes from Ludhiana to this church, and they are via NH44 and Chamba-Pathankot Road, and via Bela-Behrampur Road. There are two routes from Jalandhar to this church, and they are via NH44 and Chamba-Pathankot Road and via NH54 and Chamba-Pathankot Road. There are three routes from Amritsar to this church, and they are via NH54 and Chamba-Pathankot Road, via Chamba-Pathankot Road, and via NH44 and Chamba-Pathankot Road. The closest airport to this church is located in Dharamsala at a distance of 130 km. The Gaggal Airport is well connected to cities such as New Delhi, Chandigarh etc. There is no real religious significance or myth attached to this church apart from the fact that this church was funded and constructed by “Protestant Catholics” in 1903 during the British Raj. So, in other words this shrine is dedicated to the “Protestant Christians”.